Strong international participation in Turkish Ju-Jitsu Seminar acknowledge the efforts of a new leadership in Turkey to bring Ju-Jitsu up to the top sports. 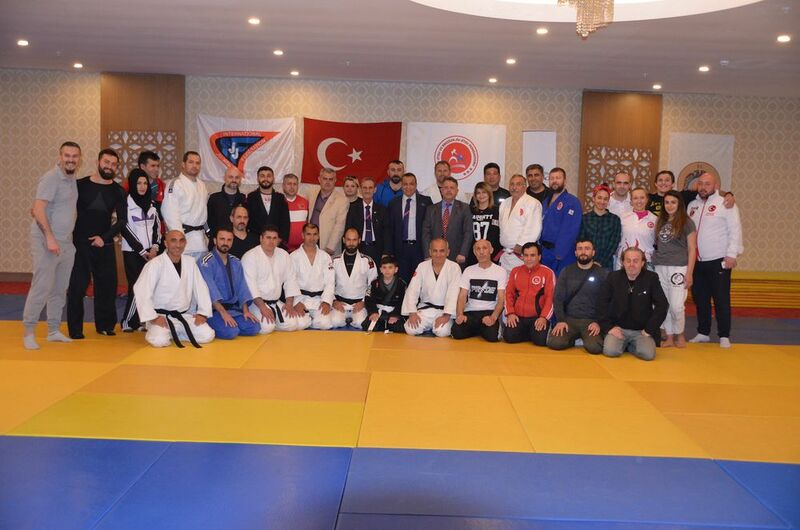 Ju Jitsu and Brazilian Jiu Jitsu Turkish seminar with international participation was held in Antalya's Alanya district dated on 30th of March to 1st of April 2018. The program included tyraining and competition rules with new changes and basics for the coaches. JJ & BJJ Turkey Chairman Yasar Yurdakul said that “The aim of the seminar that they have organized managed by Mr. Bunyamin Er, the Technical Vice-Presidet with the collaboration of JJIF, is the preparation for International Referee Exam in the future and the possibility for hosting a Beach World Tournament. JJIF President Theodoropoulos and Turkey JJ & BJJ Chairman Yasar Aykut Yurdakul has emphasized to open a coach and referee development seminar to be supervised and supported by JJIF Sport Director Mr. Joachim Thumfart. Together with the preparation and work of Technical Vice-President Bunyamin Er this guaranteed an international reputation for the coaches and referees in the field of Ju Jitsu Sports. Big parts of the seminar were conducted by the strong Brazilian Jiu Jitsu Champions Mr. Lucas Figueiredo, Blackbelt in Ne-Waza Jiu-Jitsu. The Seminar was attended by 75 coaches, referees and athletes.